Exotic blend of bubinga and solid red cedar for complex tone and great looks. 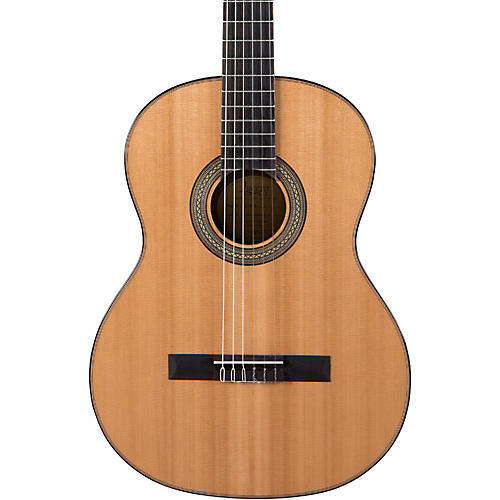 The Lucero LC230S classical guitar features nylon strings and the exotic look of bubinga back and sides, combined with a solid red cedar top for exquisitely warm tone and incredible looks. A rosewood headstock overlay matches the Indian rosewood fingerboard, and its custom all-wood rosette gives the LC230S its classic, high-end look — all wrapped in rosewood binding. A one-piece mahogany neck is then sculpted to feel comfortable in any guitarist’s hands. As with all Lucero instruments, the LC230S is carefully inspected and set up in our U.S. stateside facility to ensure optimal playability. Neck Width at Body: 2-1/2"
Width at Lower Bout: 14 1/2"
Order this Lucero Classical today.